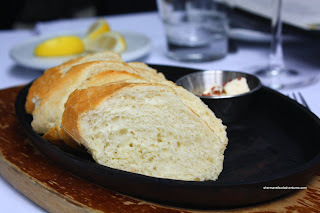 Slowly, one-by-one, I have been visiting each and every Glowbal Group restaurant. The quest started with Italian Kitchen, then Society, Trattoria, Coast and now the flagship, Glowbal Grill Steaks & Satay. Only Sanafir remains (which I have since visited and also Black + Blue). Despite not being a chain by name, the Glowbal Group does have some similarities with each and every restaurant, namely their signature item - Kobe Meatballs. Another theme throughout is the commitment to style, service and decor. Some would argue that it's smoke and mirrors to hide something... like the food. That would be true for Society; but honestly, the food has been acceptable at the all the others so far. Joining me today was Rich Guy (2nd time in less than 12 hours), Whipping Girl and Vandelay. Nice to have dining company, especially since I wanted to leech food off of their plates! Since early 2010, Glowbal has somewhat reinvented itself by adding steaks, in addition to their satays, as a specialty to their menu. 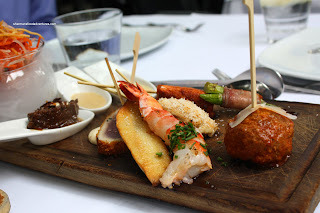 As such, we started with the Chef's Selection of Satays. We got one each of Braised Short Rib, Panko Crusted Ahi Tuna, Tiger Prawn, King Mushroom, Kobe Meatball (not sure how this is a satay), Blackened Wild Salmon, Coconut Chicken and Prosciutto-Wrapped Aspargus. Served on the side was a Thai slaw, ginger white soy and Chinese hot mustard. Of the aforementioned items, the short rib was my favourite. Of course, you can't lose with braised short rib. It was tender and full of flavour (of the rich savoury variety). The tiger prawn was cooked nicely with a nice snap to it while the mushroom still retained a certain firmness. Cooked perfectly rare with a crisp panko coating, the tuna went well with the tobiko aoili. Nice textural contrast there and not too much condiment to hide the natural flavour of the tuna. The blackened salmon was overcooked and a bit bland while the asparagus was perfect accompanied by the saltiness of the prosciutto. 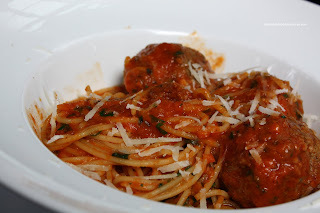 And as for the Kobe meatball, it was more firm than what I've had in the past; but still moist. We universally didn't care for the coconut chicken - Overcooked and flavourless. Whipping Girl likes meatballs and had a whole plate of them in the Spaghetti Kobe Meatballs. She thought that the meatballs were slightly underseasoned compared to other times she's had them. Otherwise, the pasta was al dente and the sauce was well-balanced. I thought it could've used a bit more salt though. 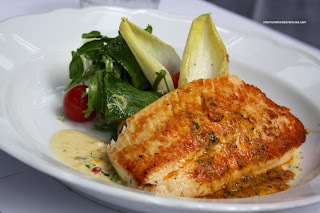 Rich Guy selected the daily feature which was the Seared Arctic Char with a buerre blanc sauce. The fish was prepared perfectly. Flaky and moist inside and nicely seared on the outside. Not too much in the way of sauce; but that's a good thing. Let the seafood stand out and it did here. Rich Guy kept remarking how surprisingly good the fish was cooked. Vandelay opted for the Parpadella with short rib, woodland mushrooms, toasted pine nuts and cafe âu lait. I gave this one a try and you know what? It was pretty good. 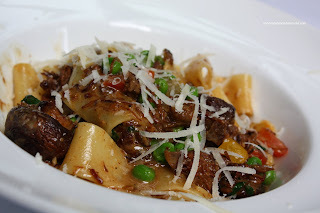 Of course, once again you can't go wrong with short rib and combined with the the earthiness and nuttiness from the other ingredients, it had a pleasing taste. I would've liked the pasta to be even more al dente (Vandelay thought it was fine); but otherwise a well-executed dish. For myself, I went for their lunch special in the Grilled Striploin with mushroom ragout. For $16.00, this was a decent cut of beef. Well-marbled, tender and cooked the way I wanted it (medium-rare), I was pleased with my selection. 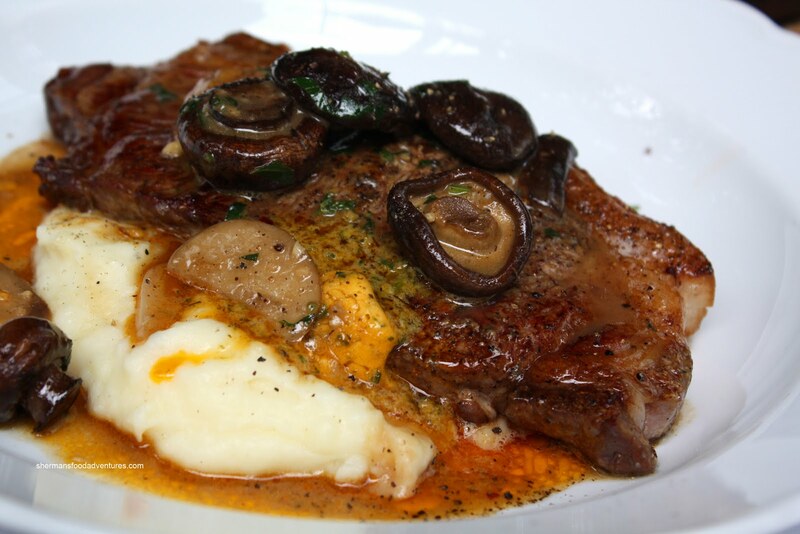 The mashed potatoes were creamy, while the bevy of mushrooms was welcomed. Only thing I would change would be the sauce. It was both too oily and salty. Sure, it flavoured the meat; but maybe a tad too much so. Interesting... We all came here not expecting much. 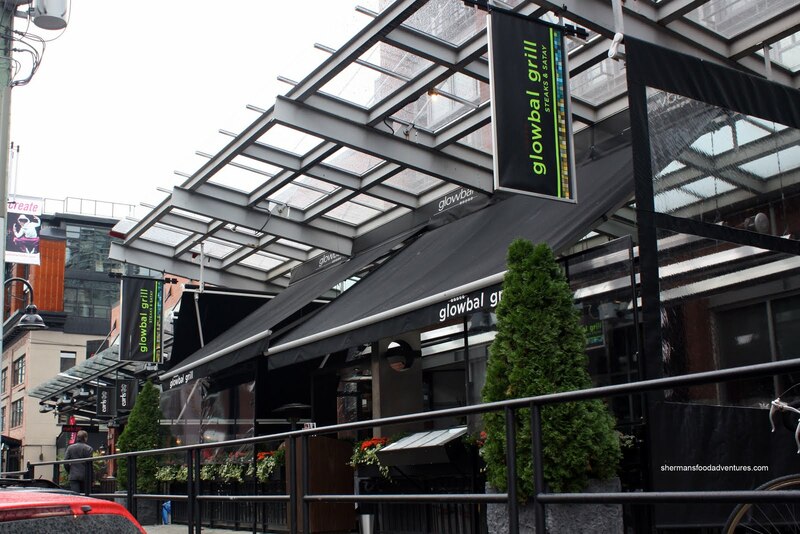 After all, the Glowbal Group routinely gets trashed for its so-so food. But honestly, for the prices we paid (including the Costco gift card discount) made for some reasonably-priced eats. And good eats at that. Sure, it won't put fear into other fine-dining establishments nearby. However, we all agreed that Glowbal trumps both Earl's (which is next door) and Milestone's since the food is both better and less expensive (assuming you use the discount).